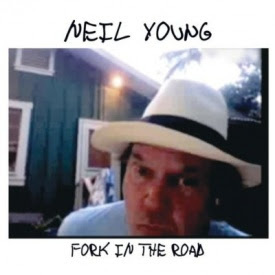 Neil Young - Fork in the Road - Young's latest record is inspired by his LincVolt, a Lincoln Continental that was retooled to run solely on alternative energy. The Hold Steady - A Positive Rage (CD/DVD) - This set includes a 17-track live CD of the band's Halloween 2007 performance at Chicago's own Metro, as well as a documentary DVD that features interviews, live footage and fan commentary. The Thermals - Now We Can See - For their fourth LP, the Portland-based trio delivers catchy indie rock/punk that has so far been well-received by both critics and fans. Superchunk - Leaves in the Gutter (EP) -After seven years without a CD release, Superchunk are back with this five-song EP just in time for their 20th birthday and upcoming Coachella performance. Paper Arrows - Things We Would Rather Lose - The local indie pop/rock band's second full-length, following last year's Look Alive. They'll play Schubas on May 17. Haymarket Riot - Endless Bummer - New album from the local post-punk band, featuring nine tracks and available through their site. Catch them live at the Hideout on May 16.